Manchester City star Kevin De Bruyne has tweeted that there is ‘everything to play for’ after tonight’s thrilling 2-1 Premier League win over Liverpool. Goals from Sergio Aguero and Leroy Sane delivered a vital three points for City at the Etihad Stadium, ending Liverpool’s long unbeaten run and making the gap just four points now between 1st and 2nd place. 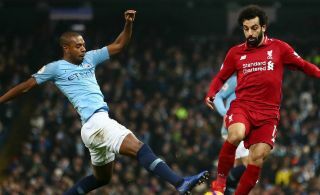 Having romped to the title last season on 100 points, City may well feel they’re now favourites again after getting back to within touching distance of the Reds. De Bruyne certainly seems confident that the title race is back on, with many fans and pundits alike seeming to feel that had Liverpool won tonight it would most likely have been game over. The Merseyside giants have not won a league title since all the way back in 1990 and were also beaten to the trophy by City in a close-run title race back in 2013/14. Liverpool fans will be having bad memories of that now as they go into the second half of the season needing to maintain the incredibly high standards they’ve set for themselves early on in this campaign.